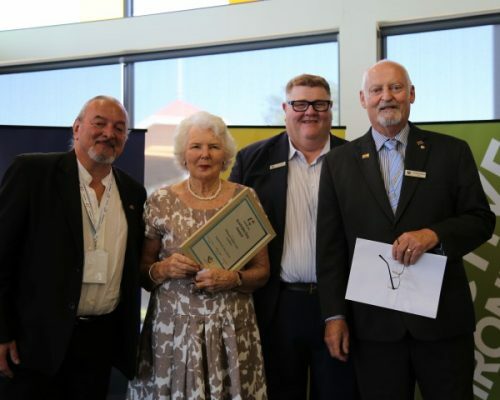 The Willaura Healthcare Auxiliary was the recipient of the Ararat Rural City Community Spirit Award on Australia Day, for its work over many years on the Willaura Healthcare Outdoor Market. Since its inception in 2005, the Willaura Healthcare Auxiliary’s annual Willaura Healthcare Outdoor Market has brought the Willaura and wider community together. 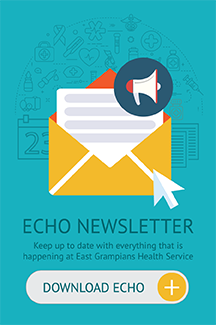 In that time the market has also raised more than $70,000 for Willaura Healthcare to improve the lives of residents of Parkland House Hostel and patients in the hospital. Most importantly, the market day has proven a valuable social and cultural event on both the Willaura and wider region’s community calendar. Market coordinator Jane Millear accepted the award at the Australia Day Celebrations in the Alexandra Oval Community Centre on behalf of the Auxiliary, with treasurer Mandy Heard and Auxiliary member and EGHS Board vice chair Heather Fleming attending. Mrs Millear was presented with the award by Mayor Cr Peter Beales, CEO Dr Tim Harrison and Australia Day Ambassador Dominic Barbuto. “What an honour and surprise it was to receive the Australia Day Community Spirit Sward for the Willaura Market,” Mrs Millear said. “This is with thanks to the great team of the Willaura Auxiliary, their families and friends, along with the community who give time and energy to assist in every way. “I would also like to thank the Ararat auxiliaries, Board members and friends who support us in so many ways, and also Ararat Rotary, with their experience in car parking. “It is good to see so many people enjoy a day in a country setting and for us all to enjoy their company, knowing the proceeds will add to the comfort of the residents and patients.